Workforce diversity is a workplace that comprises a broad mix of employees from different racial and ethnic backgrounds, and reflects a range of different ages and genders and different domestic and national cultures. Why should workforce diversity be on your agenda? A broader range of backgrounds and opinions helps to deliver more well considered and well informed decision making. Harnessing a more diverse range of skills and perspectives can increase creativity and innovation. A more diverse range of customers and suppliers are drawn to work with you as you ‘get’ their views and perspectives. This in turn can help open up new markets and opportunities. Discrimination-related litigation and compensation claims could occur less frequently. Confidential and comprehensive, PeoplePulse’s Staff Diversity Surveys provide a clear picture of the make-up of your workforce to help you develop policies, initiatives and training that will be inclusive for all. You shouldn’t be relying on gut feel alone to devise your plans. By better understanding and quantifying the make-up of your organisation’s workforce you become better equipped to develop strategies and practices that promote a healthy, diversified culture. PeoplePulse delivers a proven and confidential solution to organisations wishing to run a professional staff diversity survey. Our online reporting console is both intuitive and comprehensive. PeoplePulse’s heat maps, for example, can quickly help you identify strengths and weaknesses in your workforce diversity practices, filterable by any demographic you require. Utilise our diversity questionnaire, or bring your own. Your survey can also be PeoplePulse branded, co-branded, or branded in your corporate style – you decide. Our Project Managers have extensive experience in the set up and delivery of best in class Staff Diversity Survey Projects. Their role is to ensure your survey runs in an efficient and effective manner from start to finish. Quickly uncover the profile of your organisation. Easily identify strengths or weaknesses. Filter results by gender, location, age, department, or whatever variables interest your organisation. Our reporting is fantastic! 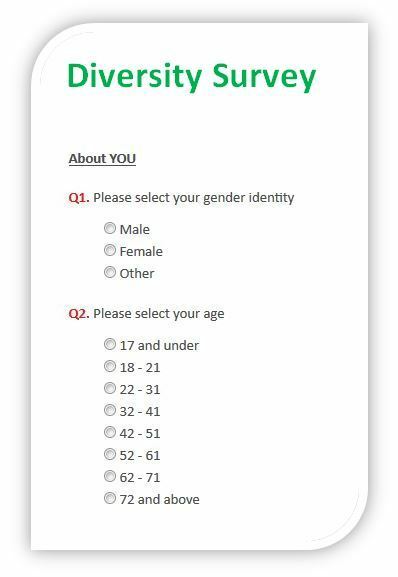 Utilise our proven staff diversity survey template, or bring your own questions, or use a mix of both. Why waste your staff’s time by asking them to complete pages of demographic data? PeoplePulse lets you pre-load that information. Your survey will be shorter, and your staff will love you for it. When it comes to the issue of diversity, surveys can cover subject matter of a very sensitive nature. Rest assured the PeoplePulse solution treats your staff responses with the utmost respect and confidentiality. All data is held on secure 256bit encrypted servers. We get that running a successful diversity survey is about far more than selecting the right survey software. At PeoplePulse we combine the very best in online survey software and reporting with your own dedicated Project & Account Manager to build your survey and manage your survey process for you. I truly enjoyed working with my Project Manager and would have no hesitation in recommending this approach to managing a survey in future.